NEWSDESK, — Kurdistan forests are set on fires deliberately by the Iranian state agents to strip the Kurdish guerrillas of the natural shelters. Hundreds of acres of South and East Kurdistan forests have been destroyed by fires that according to eyes witnesses have been deliberately set on the forests by the Iranian state agents to ostensibly deprive the Kurdish guerrillas of the natural shelters. Once again the forests of Hewraman, Penciwen, Qeredax and Meriwan have been set ablaze resulting in destruction of hundreds of hectors of lands. “Fires ignited on the forests of East Kurdistan in 28 September spreading through Hewraman Mountains are burning a sizable amount of lands,” confirmed Kosret Selam chief of forest guards in Biyare. In the meantime another instance of conflagration is reported on the forests of Kani Seyf village which is persisting to the present time. 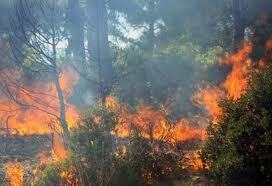 The conflagration, said a local man, has inflicted outstanding damages to the forests and gardens of these areas. Another conflagration was reported three days ago, in Peshkewe village of similar zones and due to the failure to contain it; it has spread through Badanewe village in Pencwen district. The conflagration is said to have reached Sewsenan district of Qeredax on yesterday causing huge damages to the natural and vegetation lives in these areas. The local farmers ultimately managed to extinguish the fires, the report said. In the meantime more than 150 instances of conflagrations have been reported in the country side of Meriwan city which have devastated a large chunk of its forests and jungles. Despite occurring of over 150 instances in Meriwan spanning the villages of Baram Awa, Hesen Awle, Kolan and Ingice, only the Green Assembly of Mountains, an environmentalist organisation, has tried to extinguish the fires.